A Table of Authorities is common in a very long legal document to summarize the sources cited in the document. By creating a Table of Authorities in your Word 2013 document, you provide an aid to other legal professionals who may work with the document and need to verify the sources cited. A Table of Authorities is like a Table of Contents except it refers only to citations of legal precedents (also known as authorities). 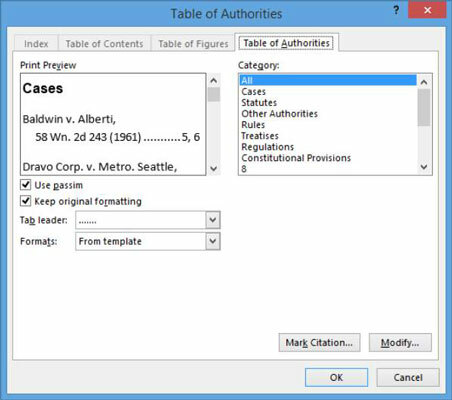 To create a Table of Authorities, you first enter each citation within the body of the document. 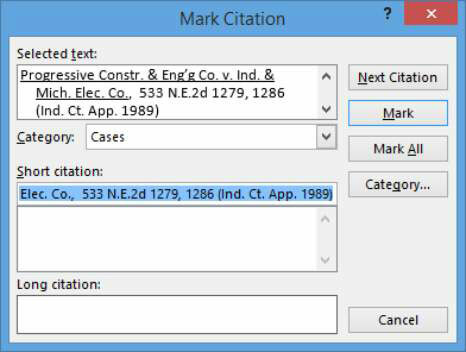 Then you mark each one as a citation via Word’s Mark Citation feature. Finally, you assemble the Table of Authorities, compiling all the marked citations. Open a Word 2013 document in need of a Table of Authorities. When you are instructed to select a citation, select all of the underlined citation text plus the parenthetical information that follows the underlined text. The parenthetical information is part of the citation. Select the first citation in the document and then choose References→Mark Citation. The Mark Citation dialog box opens. A field code is inserted into the document. Click Close and examine the code that was inserted. The code is visible because Word switches to a view that includes hidden text and nonprinting characters when you open the Mark Citation dialog box. The following shows the inserted code for the first citation. The code is shaded in for easier readability but it won’t appear shaded on your screen. Select the second citation in the document (in this example document the last line of the paragraph) and choose References→Mark Citation. 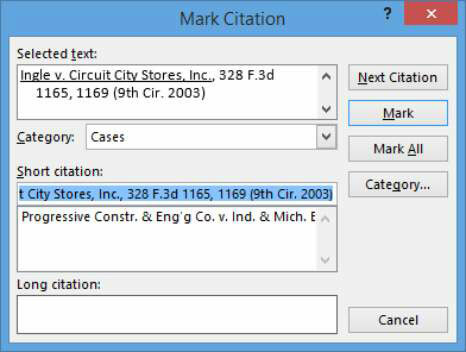 The Mark Citation dialog box opens, with the selected citation filled in. Click the Mark button to mark the citation and then click Close to close the dialog box. Choose Home tab→Show/Hide (to toggle off the nonprinting characters (including the codes for the citations). Click at the bottom of the document to move the insertion point there, press Ctrl+Enter to start a new page, type Table of Authorities, and apply the Heading 1 style to it. The Table of Authorities dialog box opens. Click OK to insert the Table of Authorities with the default settings. The Table of Authorities appears in the document.